The Clean & Clear Continuous Control Acne Cleanser is an ideal and affordable facial wash that not only combats acne, but keeps fighting it for a long period of time. For some of us, acne is an ongoing problem that extends much past our teenage years. Therefore, it is essential to find a product that is not only worth its price, but helps prevent future breakouts, especially for those of us with moderate to severe acne. This thick and creamy acne cleanser comes in a stylish 5oz. purple tube, and stores perfectly in your bathroom shelf or cabinet. It also contains benzoyl peroxide (10%), which is a great acne-fighting compound that clears pores and reduces the amount of bacteria in them. It also has antimicrobial properties! The Clean & Clear Continuous Control Acne cleanser “not only removes dirt and oil, it also features a pore-penetrating technology that deposits acne medicine to help fight and help prevent breakouts long after you wash.” This particular cleanser asserts that buyers will begin to see clearer skin through daily use. And the acne cleanser certainly lives up to this claim! While it does not eliminate acne completely, the daily formula dramatically reduces the amount of acne blemishes after repeated use. I can even feel the cleanser working when I apply it to my face. It leaves a tingly and cooling sensation that makes my skin feel very refreshed! The magic is in the strong dosage of benzoyl peroxide, which is what makes the cleanser really work. I absolutely love using this product, and no other cleanser works the same way. 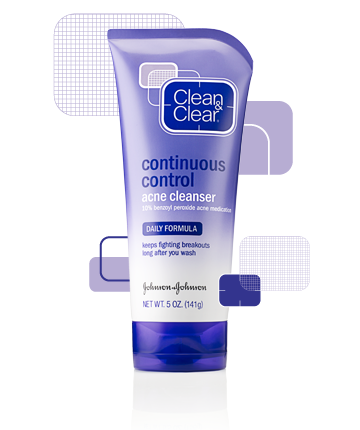 If you are struggling with acne as an adult and need a cleanser that is designed for acne-prone skin, the Clean & Clear Continuous Control Acne Cleanser is your best bet. It improved my complexion through daily use and even skin texture over time. It is very easy to use, and does not feel heavy or greasy whatsoever. The cleanser treats blemishes that already exist, and works to prevent future ones. It is the perfect cleanser to include in your skincare regimen if your acne is moderate to severe. I found this cleanser extremely effective, as there are barely any other products on the market with 10% benzoyl peroxide in its solution. I can bring it anywhere I go, and it combats my oily skin quite well. I can also find this acne cleanser in just about any drugstore, with an affordable drugstore price. It will run you anywhere from $6-$10. The Clean & Clear Continuous Control Acne cleanser has even been mentioned in Teen Vogue as one of the best drugstore products for acne, as suggested by dermatologist Anne Chapas. However, if you have sensitive skin or don’t break out too often, you may want to look at another cleanser that isn’t as strong. Otherwise the cleanser may irritate your skin! Because the product is so strong, I found that it can also bleach your clothes and fabrics, so it is important to wash your face thoroughly after using it. If this cleanser doesn’t prove to be too beneficial to your particular skincare problem, there are many other acne solutions from Clean & Clear that are more gentle and tailored to acne conditions that are less severe. These solutions contain salicylic acid, which is also an acne fighter. Neutrogena also offers similar products, at the same reasonable price. With all of the acne products out there in the market, it is hard to find the right one that will suit your specific problem. If you tend to get more acne blemishes that other people, like me, and need an affordable solution to your problem, the Clean & Clear Continuous Control Acne Cleanser is the best and strongest choice. The cool sensation that the benzoyl peroxide solution assures you that the product is really working, and results will show in due time. Don’t let the blemish-free models in all those skincare advertisements fool you; the solution is in the ingredients, and the 10% benzoyl peroxide in this cleanser will work wonders for you.